From all the previous posts on Taipei, you could see that we covered many attractions on Day 1 whether they were planned or accidental stumbles. After having walked far too much on Day 1, we spent the rest of our days in Taipei in a more relaxed manner. Whenever it rained, we continued sleeping in or simply whiled the time away watching cable TV till we were ready to go out. Going to Taipei 101 (台北101) was decided on Day 2 after having seen the weather forecast that it was cloudy that day and that the rest of our days in Taipei would be rainy. There was no point in being atop of Taipei on a rainy day when visibility wouldn't be clear, right? We continued to utilize our breakfast coupons that day. As usual, these bread weren't filling. They simply prevented us from being too hungry while waiting out the rain. A blood donation van? What an interesting concept! To the Metro we went coz we wouldn't want to do a walking trail again. When we emerged from the underground station, this massive glass building greeted us. So that's how Taipei 101 looked like when standing at the foot of it. There was practically no queue to the Observatory at all which surprised us as we often hear and read about how long the queue would be. While in the queue, we saw this on the screen and took a shot since we would not be buying those ridiculously-priced photo holder souvenir. 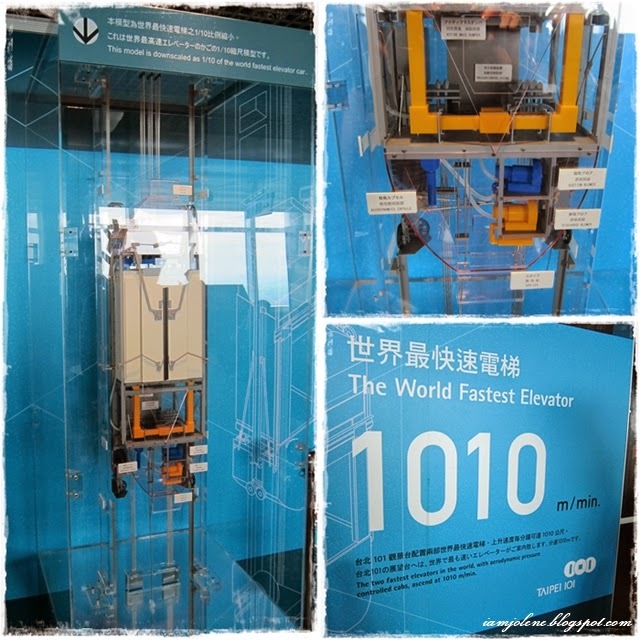 The lift to the Taipei 101 observatory tower holds a Guinness World record of being the fastest ascending elevator speed: designed to be 1 010 meters per minute or 16.83 m/s or 55.22 ft/s or 60.6 kilometres per hour or 37.7 mph. I found this video on YouTube. Experience how being in the world's fastest lift feels like in this video! Walking to the glass panels with 360-degree views, we decided that we were in dire need of an audio guide. The kindly old "uncle" who was helping tourists with audio guides saw like we really needed one and spoke to us in Japanese. He also handed us Japanese audio guides to which we told him in Mandarin that we needed the English ones. For a split second, he gathered his thoughts before apologizing and handing out the English ones to us. 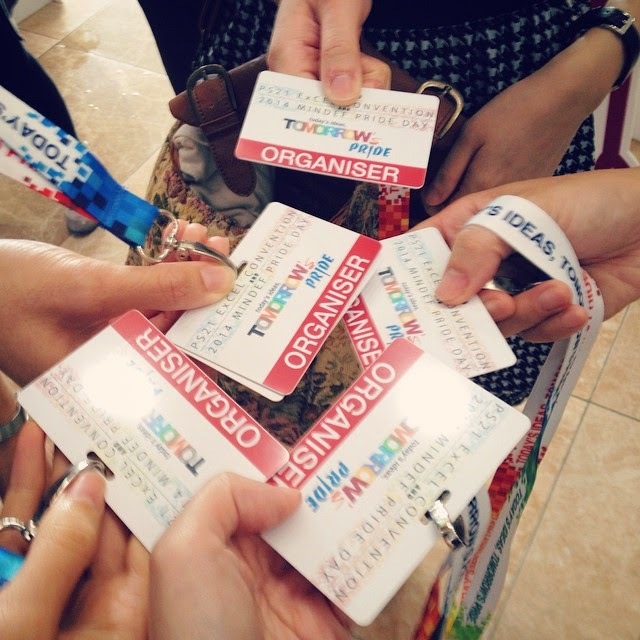 (We are not Japanese x3) That was three times within a span of 10 minutes that people assumed we were Japanese. And I thought this only happens in western countries where the Caucasians couldn't tell East Asians apart. We are proud to be SINGAPOREANS. Trying to act cool with the audio guide by pretending I was living in the 80s and owned a handphone. 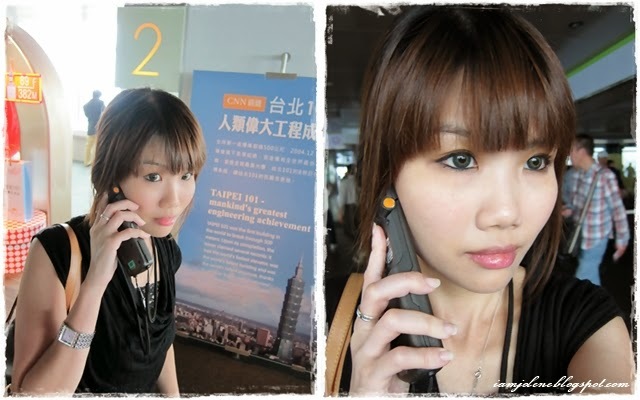 Anyone remembers those colossal handphones from the 80s? When I was looking at the whole of Taipei city from atop the observatory, I felt that going to Taipei 101 is probably the most practical first stop of anyone's first visit to Taipei. From the viewing lounge, you could see almost all of Taipei as you stroll around the glass panels with 360-degree view and get a sense for where everything is in the city. 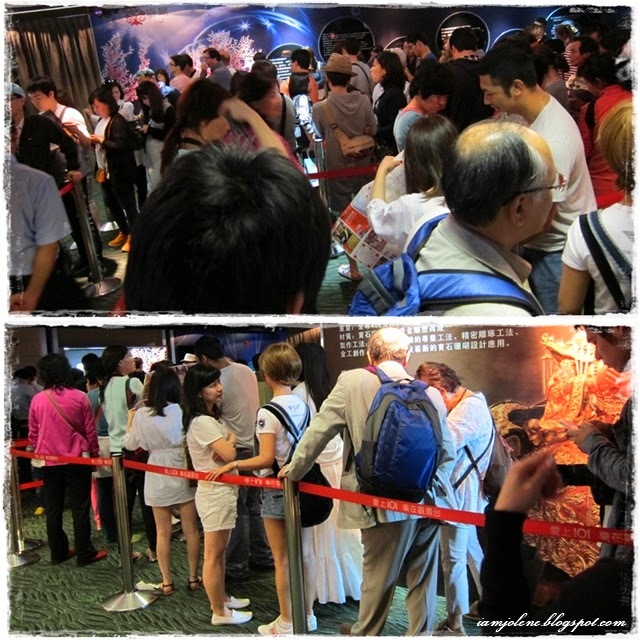 The viewing lounge itself is like a mini museum depicting facts and history of Taipei, as well as of the construction of Taipei 101. There are big touch screens facing the north, south, east and west that have time lapses of the view outside with floating buttons of all major points of interest. Together with the touch screen guide and audio guide, the view from the observatory is excellent for developing a mental map of the whole of Taipei city. I hate it when I take pictures of things I found significant at the time of snapping, went home, and forgot why I took those pictures. I've got so many other pictures that even after researching on Google Maps, I still can't tell which landmarks I was capturing in those photos. I remember the audio guide pointing out the significance of the 2 to 3 arch bridges you see in the far distance of this photo. It was so difficult to Google the name of these bridges but I reckon they are the Rainbow Bridge, Maishuaiyi Bridge and Maishuaier Bridge. I know that one of these bridges is really beautiful by night illuminated with neon rainbow lights. The many mountains in Taipei fringed the city of which Yangmingshan would be one of our stops. The most prominent sights are the Sun Yat-sen Memorial Hall (國立國父紀念館) and the Taipei Arena (臺北小巨蛋) which is still undergoing construction. The Sun Yat-sen Memorial Hall would be our next stop after Taipei 101. Looking to the right and further down are the Discovery Center of Taipei in Taipei CIty Hall and the Taipei World Trade Centre Exhibition Hall 3. Guess what is circled in here? Clue: We visited this place the day before. Zoomed in: It's the whole Liberty Square (自由廣場) area. The orange roof of the National Theater and National Concert Hall are prominent enough for us to catch only with the help of the touch screen guide and zooming the lens to the max. Panels depicting tall buildings around the world. Ignore bored-looking tourists. You could mail a postcard here. Taipei 101 was the tallest building in the world from 2004 to 2010, when the Burj Khalifa in Dubai overtook it. However, the skyscraper remains a symbol of technology innovation designed to withstand natural disasters like typhoons and earthquakes. This gigantic gold-coloured damper is responsible for keeping the building stable through typhoons and earthquakes. I don't know how the Damper Baby stems from the Damper and only after reading up did I know that the damper has become such a tourist attraction, that the city has given it a mascot, the Damper Baby. It even has its own damper website which is really cute. 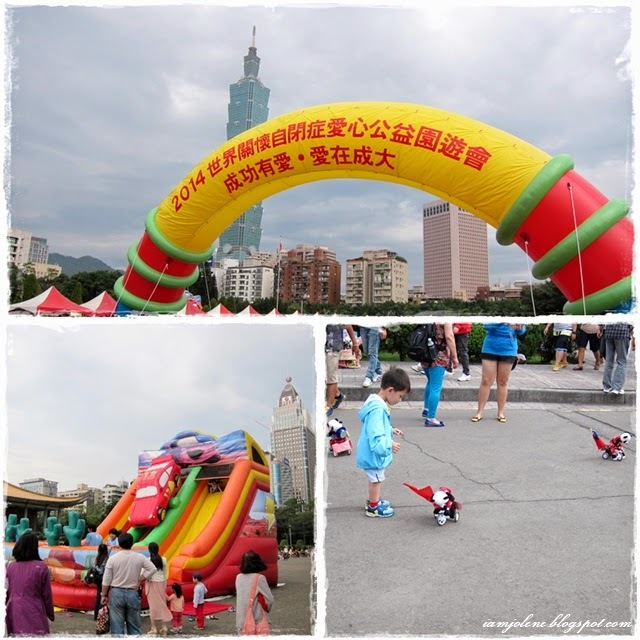 Only the hub can do something so dumb with the Taipei 101 Damper Baby mascot. 101, 101, 101. We proceeded from the 89th floor to to the Outdoor Observatory Deck on the 91st floor which is only opened on some occasions, weather permitting. Then what's on the 90th floor? It's probably not accessible by us. It was so cold on the outdoor deck! Fortunately we had our jackets with us. Mirror wefie. Hubz said he should copy the way I stand. We sought refuge from the cold by watching a film on the construction of Taipei 101. 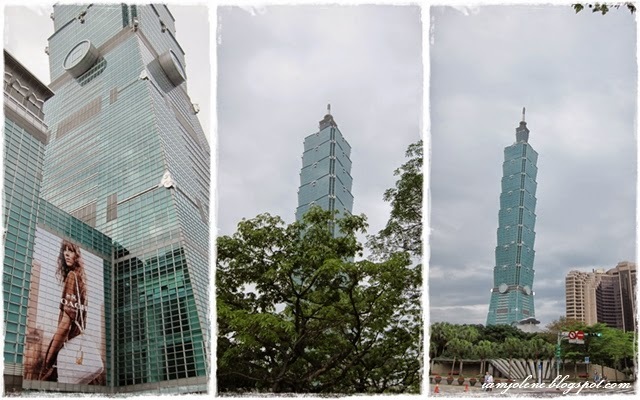 Did you know that Taipei 101 is The World’s Tallest Green Building? TAIPEI 101 successfully attain the LEED-EBOM Platinum level certification, making it the world’s tallest Green Building in the world. LEED (Leadership in Energy and Environmental Design) is the most internationally recognized Green Building rating system. I'm always impressed when huge organizations do their part to be eco-friendly. 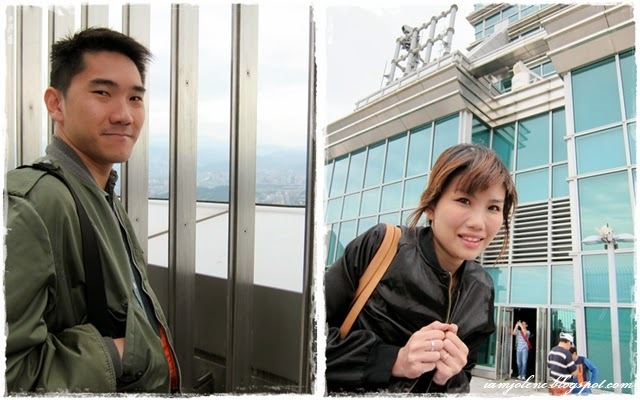 Know more about their green program in this Taipei 101 Green On interactive website. 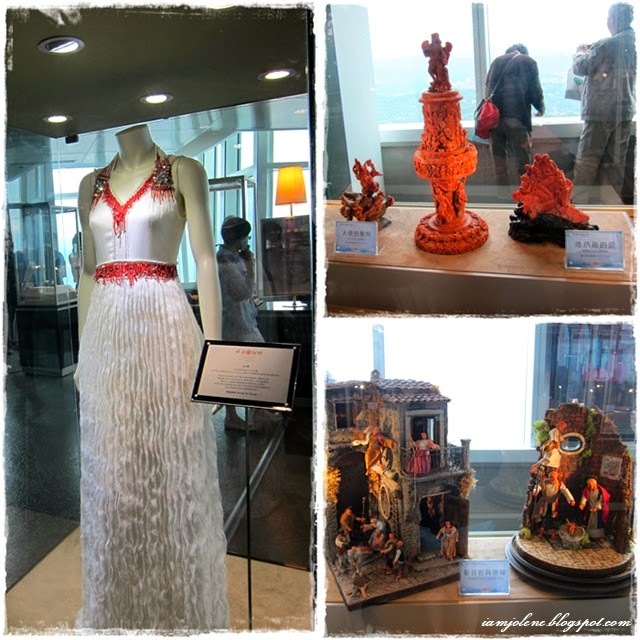 There were exquisite exhibits on display and on sale. While we needn't queue to get up to the observatory, we had to queue to get down! Crowd aside, I took this photo with the sole purpose of trying to snap a front view of a pretty East Asian girl to no avail. The girl sporting short golden hair looked just like a life-sized doll! Huge peepers with fan-like lashes, chiselled pixie face, smooth and slightly tanned skin. The kind of pretty I like! I wonder if the Taipei City Hall is like our Singapore City Hall. Taipei 101 had been enriching. Our next stop was to have "dunch", "linner" ... whatever... late lunch/ early dinner. Where else better to have mala hotpot (麻辣火鍋) than Taipei? 醉麻辣 was recommended by my friend and that place so happened to be along the area of Sun Yat-sen Memorial Hall. More on our meal in the next post. So anyway this picture shows a curious-looking stream. We couldn't decide what is was and why it was there. The memorial hall contains displays of Sun Yat Sen's life and the revolution he led, and is also a multi-purpose social, educational and cultural center for the public. Taiwan's highest movie award ceremony, the Golden Horse Film Festival and Awards, is held annually in the Memorial Hall Auditorium. The park surrounding the hall is named Zhongshan Park, as the Chinese name for Dr Sun Yat Sen is Sun Zhongshan (孫中山). It is a popular area for families to hang out as their kids could roam freely. There was a charity bazaar that day. If I'm reading the words correctly, it is an awareness event for autism. We did not visit the memorial hall and simply strolled through the park as all we wanted to do was to eat. I was attracted to the beautiful flowers though and could not help snapping this. Stay tuned for the conclusion of Day 2 with our food adventures for the night. Yummy yummy. I'm hungry just thinking about it. I've replied to all your comments so do check back on the posts. In the meantime, please keep the love notes coming in! Thank you all for sharing more about yourselves on my previous post. I felt like we were sitting down and having a lovely personal conversation over a cup of tea. I love the stuff some of you have shared about your ethnicity and the funny incidents too. It is definitely a joy reading and knowing more about you. I appreciate that you took the time to craft your comments and I will reply all of you over the next few days so check back on my replies here. Also, Taipei updates would take a back seat for the time being as you might just be tired of seeing Taipei, Taipei and more Taipei. Nah... in actual fact, I need lots of time to craft travelogue post as editing photos and doing some quick research for my contents would take some time. Here's October instasummary. 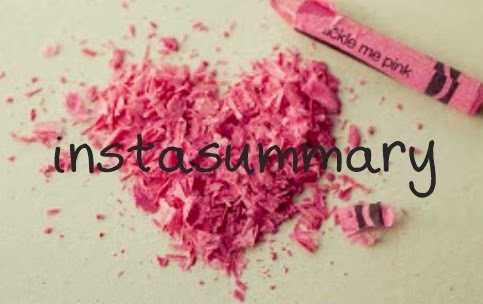 Instagram videos on blog run in fast forwards, skips and jumps. They are better viewed on iamjolene Instagram page itself for sound and image quality, as well as full streaming. Olive leaf extract (OLE) in general promotes cardiovascular support, immunity support and is a powerful antioxidant. People take OLE to keep cold, flu and infection at bay. This product helped kept an impending throat infection at bay today. I woke up with a pounding head and tight pain in the throat. Over the years, I know that headache, throat pain, and warm neck and face are signs of an impending Upper Respiratory Tract Infection (URTI). Once I got home, I squirted the OLE into my throat and the symptoms of URTI slowly diminished. I've been taking this product for the past 9 months rather irregularly. I put a bottle at the basin and whenever I remembered or am fine with subjecting myself to the YUCKY taste, I would squirt it directly into the back of the mouth. The squirt bottle is convenient for lazy people like me. For the past 9 months, the hubby was plagued with URTI sickness thrice and I haven't gotten any. As usual each time I felt the symptoms, I would take more OLE each day and the infection would be kept at bay. Placebo or not, I could feel the difference. Why don't I recommend this to the hubby? Well, I did but he hates the taste of it so much that he tries to avoid taking it unless I force him. OLE has a very strong taste and the one from Barlean's has a super sweet peppermint taste masking the bitterness of the extract. I hate both overly sweet peppermint taste and the underlying bitter taste. Honestly, the taste takes time getting used to. Minus 1 star for that. Some of my friends have started taking it after I told them about it and most do not like the taste too. Another farewell for another colleague and friend. All of us were so sad to see her go but she bought macaroons to sweeten our lives... for as long as the macaroons lasted... and then we were sad again. Lol 😂 I didn't expect Bakerzin macaroons to be so delicious. Not so sweet. Me LIKEY! Goodbyes are hard but we hope that the memories we have spent together as a department would stay with you as you continue to walk a memorable journey of rich experience, fun-filled days and lots of love. View full 15-sec video here. Brunch at Paris Baguette and then Yoguru for "desserts". Part 3 of our wedding anniversary staycation at the Tree Top Lofts is up on my blog (http://iamjolene.blogspot.sg/2014/10/staycation-at-tree-top-lofts-part-3.html) This final installment walks you through our Dolphin Discovery interaction with a male dolphin called Sheng Guo. Muax! Pareidolia hits the hubby this time round. When my hot chocolate came, I wondered aloud if the art was meant to be any image. Without looking up from his cappuccino, the hubby replied in a matter-of-fact manner, "It's a cat." I thought he was humoring me by associating cats with me. To which he insisted, "IT IS A CAT! Can you see the eyes, the whiskers and the hands one up one down?" All these while, he was tracing the outline and ending with his arms one up one down like how some cats always do. Ok, so folks. Presenting a cat in my hot chocolate. A cat without ears. First time at Cafe Etc All Day Breakfast • Steakhouse. This used to be where the old Ice Edge II was. We had truffle fries, foie gras, eggs Benedict and crab meat pasta. 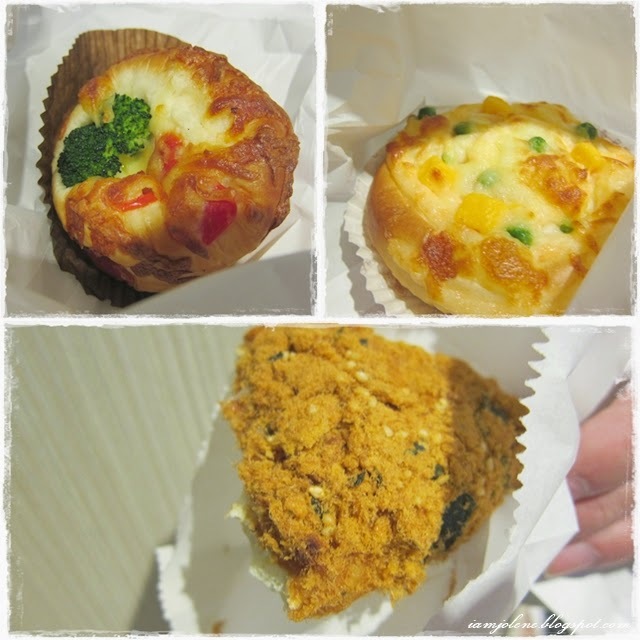 Overall, the food and service were not bad and we would definitely come back again! ~*Rurouni Kenshin: The Legend Ends*~ And so Part 3 concludes the whole Kenshin movie series. For all the prime chops of the show, refer to the many great reviews online. I was a tad disappointed that there wasn't the room by room duel like in the manga and anime. I was eager to see how the movie would portray those battle scenes (esp Saito vs Usui) but I guess 135min isn't enough for those. A great movie nonetheless! Go watch it! Post pink products for breast cancer awareness month! My perfume collection all happens to be pink (except one purple) though they vary in smell. Chloe, Lancôme Miracle, Lanvin éclat, DKNY Be Delicious, Valentino Valentina Acqua Floreale. Spotted a boiboi cat called Chestnut at Cat Socrates, a shop at Bras Basah selling beautiful knick knacks. SOoooo TIRED! Gonna be like these pandas soon. 🐼🐼🐼 Colleagues remarked that this public holiday really came at the wrong time when we needed the day to work before our major events. I guess this holiday forces us to have more rest? Happy Deepavali to all who celebrate! 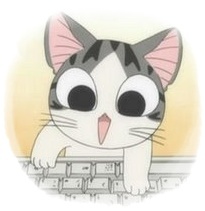 Notti cat! Evidence of her crime is still visible on her paw! @gnahiy I helped to discipline her just now. I whacked her with your slipper. We were so hungry just now. I asked the hubz, "Can I eat 1 笼 of 小笼包 all on my own? Coz I dowan to share." I love the ones at Paradise Dynasty Changi Airport. The first time I ate these xiao long bao with @eccentrice at the ION outlet, we felt they weren't too bad but just a novelty. This time round, I could taste all the flavours quite distinctively. Love the ginseng, foie gras, black truffle the best. For those who have eaten these, which are your favourite flavours? Me and 1 whole basket of xiao long bao all to myself!!! Muahahaha... On a separate note, I learnt from a post of my dear Italian friend @insta_lilliness that one fashion trend in fall is to tuck long hair into the outer wear for a short hair look. I told her that I've always been following that fashion trend for a few seconds each time I wear an outerwear coz I hate the feeling of hair in the clothes. How about you? So heartwarming to see pictures of my gal pal's desk full of lovely photo memories of our New York days with the kids. So here's dedicating a photo to my dear friend. I finally wore your kitty cat T-shirt out! Bye bye to one of my favourite tops. You know there are just some outfits that you wear to death for years? Or some outfits with significance that you can't bear to throw? So sad that when I next take out one of my wear-to-death top, it has reached its end. Last wore this in may with a stretched neckline but it has totally widened two-folds now due to the loss in elasticity. Perhaps it could still be of use as a beach throw over! Some 李 place at JEM that serves humble Taiwanese delights. Not too bad! The Mee Sua reminds me of Ah Zhong Mian Xian. Long time no eat Fish & Co. Forgot how good their butter garlic cream sauce is! It was their butter garlic prawns more than a decade ago that inspired me to have butter garlic prawns as my signature dish during cook outs with friends in school back then. We can officially keep these tags aside! It has been gruelling and fun with blood, sweat and laughter from the pre preparation stage, up till show time and till the curtains come down. We have organized many MINDEF events but never a large scale public sector one like PS21 ExCEL Convention and the inaugural Innovation Conference. This whole experience is something for us to be proud of! A beautiful colourful pixels theme was adopted for the MINDEF PRIDE Day, PS21 ExCEL Convention and PS21 ExCEL Innovation Conference publicity materials. Even the PRIDE Annual with a refreshing new size and layout embraced the same theme. I honestly didn't like this colourful pixels theme initially but it slowly grew on me. ❤ Just like the many little pixels coming together to form a beautiful theme, various colleagues worked together and did an excellent job with these booklets. Be it in the planning, providing text contents, artwork or layout, everything was pieced together elaborately. My little contribution would be designing the Heart logo for our Innovation Conference, providing some contents in the PRIDE Annual and proof reading. Mini Tic Tac! So cute! Happy Halloween to all!!! We have officially quit making up and dressing up for Halloween. 👻 One of the Halloween parties which I enjoyed the most was the one that my dear old friend, Bei put together at short notice on the actual day after being inspired by my Facebook status then. She extended the invitation to my motley crew and so there we were "terrorizing" guests with our alter egos. 👻 In the 1st 10 flips, you would have seen how the motley crew were such experts at the 十连拍 （1 to 10 poses) while Bei, our lovely devil host was struggling to keep up with us. 👻 As for the last candid pic, well... Even our ghostly alter egos were interested in poring over a camera. Getting to Know Me. Getting to Know You.